Add two additional wide seats in your living room with the addition of this two seat sofa to your home furniture collection. Defined lines, boxed cushions, wide track arms and tapered block feet create a great contemporary look that everyone is after. This sofa is available in a wide selection of fabrics as well as several leg finishes to choose from. Create a piece that reflects your personal style when you add this love seat to your home. The Pierce Contemporary Two Cushion Sofa with Track Arms by Flexsteel at Conlin's Furniture in the Montana, North Dakota, South Dakota, Minnesota, and Wyoming area. Product availability may vary. Contact us for the most current availability on this product. Wood & Finish Florentine comes standard. Other finishes available through special order methods. Padding & Ergonomics Luxury Cushions with 1.8 lb density polyurethane foam core topped with 1.2 lb density polyurethane recovery foam come standard. 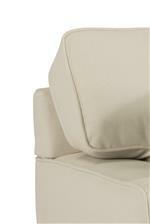 Upgrades to Plush Cushions or High-Resiliency cushions available on the chair, loveseat and sofa models. This living room collection features a laid-back yet contemporary look that will serve as a wonderful update to any home. 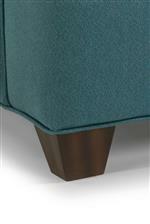 The wide track arms, boxed cushions and clean frame are lined with welt cording for a stylish touch of detail. The defined frame is complemented by tapered block feet for a contemporary silhouette. Each piece in this group is available in a wide selection of fabrics and multiple finishes allowing you to create a set perfect for your home. The Pierce collection is a great option if you are looking for Contemporary furniture in the Montana, North Dakota, South Dakota, Minnesota, and Wyoming area. Browse other items in the Pierce collection from Conlin's Furniture in the Montana, North Dakota, South Dakota, Minnesota, and Wyoming area.